The Native American story of American Horse. Learn about the culture, stories, myths and legends of American Indians and their famous chiefs and tribes. A Native American Story of American Horse to teach kids about Native Indians in a short, enjoyable, easy to read format. When he was born, his old grandfather said: "Put him out in the sun! Let him ask his great-grandfather, the Sun, for the warm blood of a warrior!" And he had warm blood. He was a genial man, liking notoriety and excitement. He always seized an opportunity to leap into the center of the arena. In early life he was a clownish sort of boy among the boys—an expert mimic and impersonator. This talent made him popular and in his way a leader. He was a natural actor, and early showed marked ability as a speaker. American Horse was about ten years old when he was attacked by three Crow warriors, while driving a herd of ponies to water. Here he displayed native cunning and initiative. It seemed he had scarcely a chance to escape, for the enemy was near. He yelled frantically at the ponies to start them toward home, while he dropped off into a thicket of willows and hid there. A part of the herd was caught in sight of the camp and there was a counter chase, but the Crows got away with the ponies. Of course his mother was frantic, believing her boy had been killed or captured; but after the excitement was over, he appeared in camp unhurt. When questioned about his escape, he remarked: "I knew they would not take the time to hunt for small game when there was so much bigger close by." When he was quite a big boy, he joined in a buffalo hunt, and on the way back with the rest of the hunters his mule became unmanageable. American Horse had insisted on riding him in addition to a heavy load of meat and skins, and the animal evidently resented this, for he suddenly began to run and kick, scattering fresh meat along the road, to the merriment of the crowd. But the boy turned actor, and made it appear that it was at his wish the mule had given this diverting performance. He clung to the back of his plunging and braying mount like a circus rider, singing a Brave Heart song, and finally brought up amid the laughter and cheers of his companions. Far from admitting defeat, he boasted of his horsemanship and declared that his "brother" the donkey would put any enemy to flight, and that they should be called upon to lead a charge. It is told of him that he once went with a war party of young men to the Wind River country against the Shoshones. 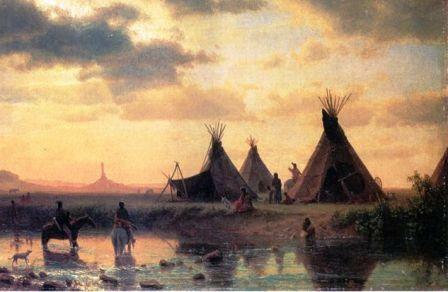 At last they discovered a large camp, but there were only a dozen or so of the Sioux, therefore they hid themselves and watched for their opportunity to attack an isolated party of hunters. While waiting thus, they ran short of food. One day a small party of Shoshones was seen near at hand, and in the midst of the excitement and preparations for the attack, young American Horse caught sight of a fat black-tail deer close by. Unable to resist the temptation, he pulled an arrow from his quiver and sent it through the deer's heart, then with several of his half-starved companions sprang upon the yet quivering body of the animal to cut out the liver, which was sometimes eaten raw. One of the men was knocked down, it is said, by the last kick of the dying buck, but having swallowed a few mouthfuls the warriors rushed upon and routed their enemies. It is still told of American Horse how he killed game and feasted between the ambush and the attack. "We were as promising a party of young warriors as our tribe ever sent against any of its ancestral enemies. It was midsummer, and after going two days' journey from home we began to send two scouts ahead daily while the main body kept a half day behind. The scouts set out every evening and traveled all night. One night the great war pipe was held out to me and to Young-Man-Afraid-of- His-Horses. At daybreak, having met no one, we hid our horses and climbed to the top of the nearest butte to take an observation. It was a very hot day. We lay flat on our blankets, facing the west where the cliff fell off in a sheer descent, and with our backs toward the more gradual slope dotted with scrub pines and cedars. We stuck some tall grass on our heads and proceeded to study the landscape spread before us for any sign of man. "The sweeping valleys were dotted with herds, both large and small, of buffalo and elk, and now and then we caught a glimpse of a coyote slinking into the gulches, returning from night hunting to sleep. While intently watching some moving body at a distance, we could not yet tell whether of men or animals, I heard a faint noise behind me and slowly turned my head. Behold! a grizzly bear sneaking up on all fours and almost ready to spring! "'Run!' I yelled into the ear of my companion, and we both leaped to our feet in a second. 'Separate! separate!' he shouted, and as we did so, the bear chose me for his meat. I ran downhill as fast as I could, but he was gaining. 'Dodge around a tree!' screamed Young-Man-Afraid. I took a deep breath and made a last spurt, desperately circling the first tree I came to. As the ground was steep just there, I turned a somersault one way and the bear the other. I picked myself up in time to climb the tree, and was fairly out of reach when he gathered himself together and came at me more furiously than ever, holding in one paw the shreds of my breechcloth, for in the fall he had just scratched my back and cut my belt in two, and carried off my only garment for a trophy! "My friend was well up another tree and laughing heartily at my predicament, and when the bear saw that he could not get at either of us he reluctantly departed, after I had politely addressed him and promised to make an offering to his spirit on my safe return. I don't think I ever had a narrower escape," he concluded. When the greater part of the Ogallalas, to which band he belonged, came into the reservation, he at once allied himself with the peace element at the Red Cloud agency, near Fort Robinson, Nebraska, and took no small part in keeping the young braves quiet. 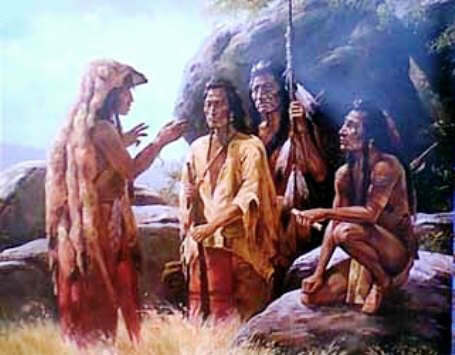 Since the older and better-known chiefs, with the exception of Spotted Tail, were believed to be hostile at heart, the military made much use of him. Many of his young men enlisted as scouts by his advice, and even he himself entered the service. In the early part of the year 1876, there was a rumor that certain bands were in danger of breaking away. Their leader was one Sioux Jim, so nicknamed by the soldiers. American Horse went to him as peacemaker, but was told he was a woman and no brave. He returned to his own camp and told his men that Sioux Jim meant mischief, and in order to prevent another calamity to the tribe, he must be chastised. He again approached the warlike Jim with several warriors at his back. The recalcitrant came out, gun in hand, but the wily chief was too quick for him. He shot and wounded the rebel, whereupon one of his men came forward and killed him. This quelled the people for the time being and up to the killing of Crazy Horse. In the crisis precipitated by this event, American Horse was again influential and energetic in the cause of the government. From this time on he became an active participant in the affairs of the Teton Sioux. He was noted for his eloquence, which was nearly always conciliatory, yet he could say very sharp things of the duplicity of the whites. He had much ease of manner and was a master of repartee. I recall his saying that if you have got to wear golden slippers to enter the white man's heaven no Indian will ever get there, as the whites have got the Black Hills and with them all the gold. It was during the last struggle of his people, at the time of the Messiah craze in 1890-1891 that he demonstrated as never before the real greatness of the man. While many of his friends were carried away by the new thought, he held aloof from it and cautioned his band to do the same. When it developed into an extensive upheaval among the nations he took his positive stand against it. Presently all Indians who did not dance the Ghost Dance were ordered to come into camp at Pine Ridge agency. American Horse was the first to bring in his people. I was there at the time and talked with him daily. When Little was arrested, it had been agreed among the disaffected to have him resist, which meant that he would be roughly handled. This was to be their excuse to attack the Indian police, which would probably lead to a general massacre or outbreak. I know that this desperate move was opposed from the beginning by American Horse, and it was believed that his life was threatened. On the day of the "Big Issue", when thousands of Indians were gathered at the agency, this man Little, who had been in hiding, walked boldly among them. Of course the police would arrest him at sight, and he was led toward the guardhouse. He struggled with them, but was overpowered. A crowd of warriors rushed to his rescue, and there was confusion and a general shout of "Hurry up with them! Kill them all!" I saw American Horse walk out of the agent's office and calmly face the excited mob. "What are you going to do?" he asked. "Stop, men, stop and think before you act! Will you murder your children, your women, yes, destroy your nation to-day?" He stood before them like a statue and the men who held the two policemen helpless paused for an instant. He went on: "You are brave to-day because you outnumber the white men, but what will you do to-morrow? There are railroads on all sides of you. The soldiers will pour in from every direction by thousands and surround you. You have little food or ammunition. It will be the end of your people. Stop, I say, stop now!" Jack Red Cloud, son of the old chief rushed up to him and thrust a revolver almost in his face. "It is you and men like you," he shouted, "who have reduced our race to slavery and starvation!" American Horse did not flinch but deliberately reentered the office, followed by Jack still flourishing the pistol. But his timely appearance and eloquence had saved the day. Others of the police force had time to reach the spot, and with a large crowd of friendly Indians had taken command of the situation. When I went into the office I found him alone but apparently quite calm. "Where are the agent and the clerks?" I asked. "They fled by the back door," he replied, smiling. "I think they are in the cellar. These fools outside had almost caught us asleep, but I think it is over now." American Horse was one of the earliest advocates of education for the Indian, and his son Samuel and nephew Robert were among the first students at Carlisle. I think one or two of his daughters were the handsomest Indian girls of full blood that I ever saw. His record as a councilor of his people and his policy in the new situation that confronted them was manly and consistent. This story of American Horse is featured in the book entitled Indian Heroes and Great Chieftains by Charles A. Eastman which was published by Little, Brown and Company, Boston in 1918. The Native American Indian Story of American Horse provides an opportunity to read about the life and times of Native American Indians and many of their great chiefs and famous leaders. A Classic Short story about American Horse for kids and children of all ages. This short story of American Horse is great to read to kids and children at bedtime. This very short story contains folklore about the famous people of Native Indian tribes. This short Native American story has been selected to keep the attention of kids and children of all ages. Many of the traditional stories featured in this section are true and others are folk stories or myths and legends. Read our free short story online about American Horse. Read a free, online short story about the people of famous tribes Native American Indians to increase knowledge and understanding of the indigenous people of North America. The Story of American Horse. Discover the vast selection of pictures which relate to the Stories, History and Culture of Native Americans. The pictures show the clothing, War Paint, weapons and decorations of various Native Indian tribes that can be used as a really useful educational history resource for kids and children of all ages. We have included pictures and videos to accompany the main topic of this section - The Native American story of American Horse. The videos on this website enable fast access to the images, paintings and pictures together with information and many historical facts. All of the articles and pages can be accessed via the Native Indian Tribes Index - a great educational resource for kids.